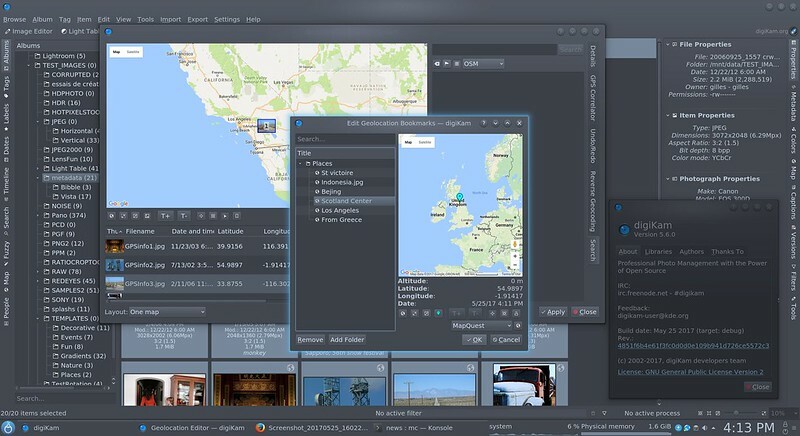 Following the 5th release 5.5.0 published in March 2017, the digiKam team is proud to announce the new release 5.6.0 of digiKam Software Collection. 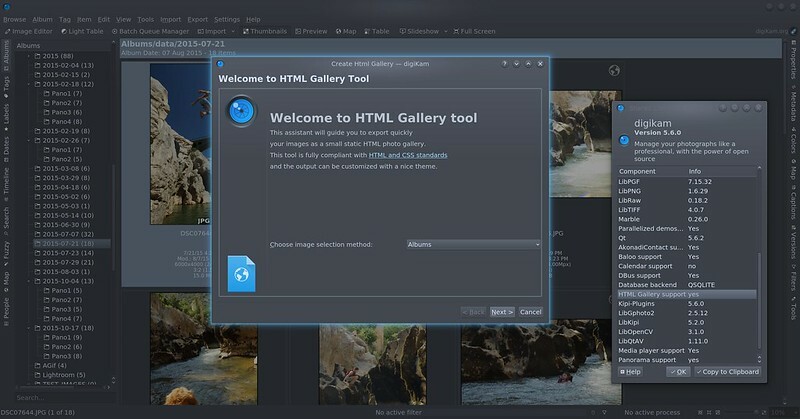 With this version the HTML gallery and the video slideshow tools are back, database shrinking (e.g. purging stale thumbnails) is also supported on MySQL, grouping items feature has been improved, the support for custom sidecars type-mime have been added, the geolocation bookmarks introduce fixes to be fully functional with bundles, the support for custom sidecars, and of course a lots of bug has been fixed. 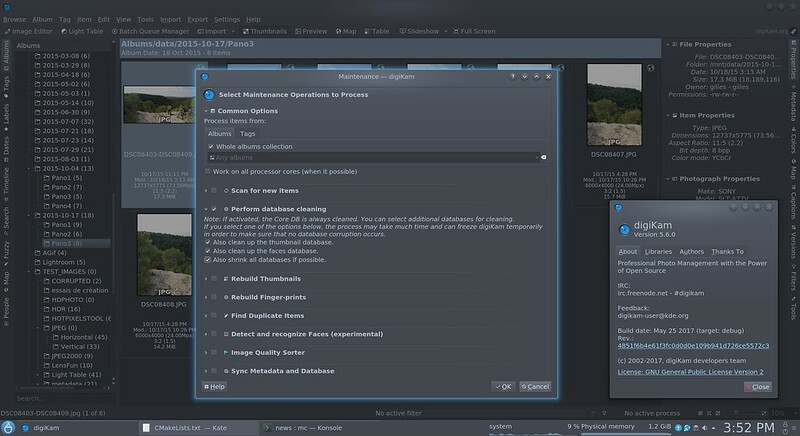 The Video Slideshow is accessible also through the tools menu in the main bar of both digiKam and showFoto. It allows you to create a video slide with a selection of photos or albums. The generated video file can be view in any media player, as phones, tablets, Blue Ray reader, etc. There are many settings to customize the format, the codec, the resolution, and the transition (as for ex the famous Kens-Burn effect). Already in 5.5.0 release, the tool dedicated to tests for database integrity and obsolete information have been improved. Besides obvious data safety improvements this can free up quite a lot of space in the digiKam databases. For technical reasons only SQLite database were shrunk to this smaller size in 5.5.0 release. Now this is also possible for MySQL databases with 5.6.0. 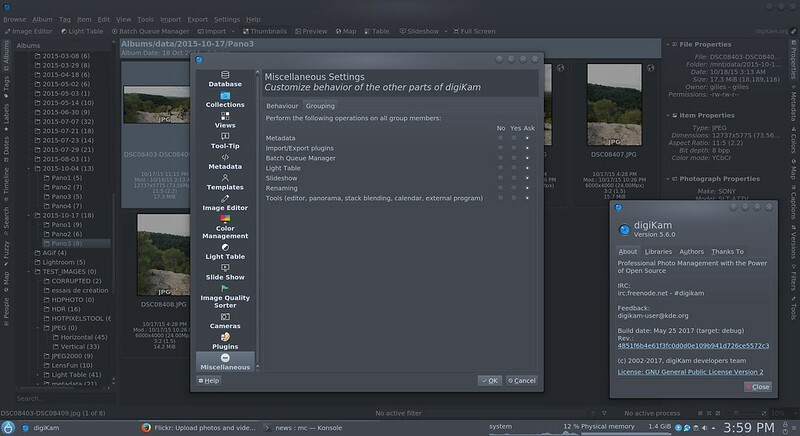 Earlier changes to the grouping behaviour proved that digiKam users have quite diverse workflows - so with the current change we try to represent that diversity. Originally grouped items were basically hidden away. Due to requests to include grouped items in certain operations, this was changed entirely to include grouped items in (almost) all operations. Needless to say, this wasn’t such a good idea either. So now you can choose which operations should be performed on all images in a group or just the first one. The corresponding settings live in the configuration wizard under Miscellaneous in the Grouping tab. By default all operations are set to Ask, which will open a dialog whenever you perform this operation and grouped items are involved. Another new capability is to recognise additional sidecars. 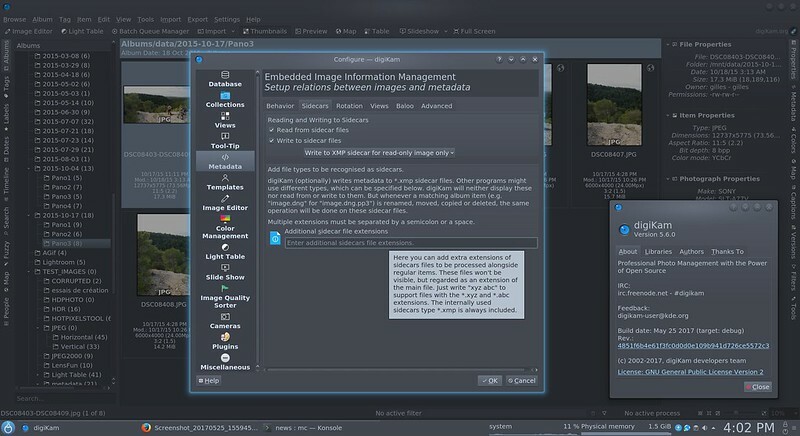 Under the new Sidecars tab in the Metadata part of the configuration wizard you can specify any additional extension that you want digiKam to recognise as a sidecar. These files will neither be read from nor written to, but they will be moved/rename/deleted/… together with the item that they belong to. Another important change done for this new version is to restore the geolocation bookmarks feature which did not work with bundle versions of digiKam (AppImage, MacOS, and Windows). The new bookmarker has been fully re-written and is still compatible with previous geolocation bookmarks settings. It is now able to display the bookmark GPS information over a map for a better usability while editing your collection. Swati Lodha is back in the team. As in 2016, she will work to improve the Database interface. 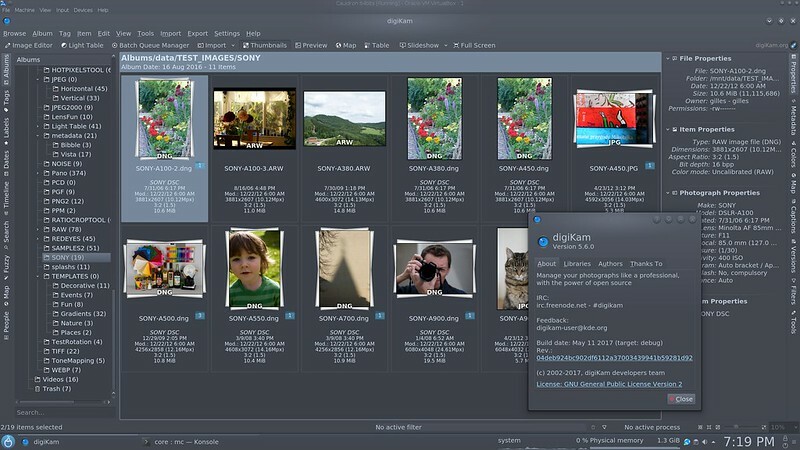 After having fixed and improved the MySQL support in digiKam, she has the task this year to isolate all the database contents dedicated to manage the similarity finger-prints matrix. As for thumbnails and face recognition, these elements will be stored in a new dedicated database. The goal is to reduce the core database size, simplify the maintenance and decrease the core database time-latencies. Yingjie Liu is a Chinese student, mainly specialized with math and algorithms who will add a new efficient face recognition algorithm and will try to introduce some AI solution to simplify the face tag workflow. Ahmed Fathi is an Egyptian student who will work to restore and improve the DLNA support in digiKam, to be able to stream collections contents through the network with compatible UPNP device as the Smart TV, tablets or cellulars. Shaza Ismail is an another Egyptian student who will work to an ambitious project to create a tool for image editor to be used for healing image stains with the use of another part of the image by coloring by the use of one part over the other, mainly testing on dust spots, but can be used for other particles hiding as well. The next main digiKam version 6.0.0 is planned for the end of this year, when all Google Summer of Code projects will be ready to be backported for a beta release. In September, we will release a maintenance version 5.7.0 with a set of bugfixes as usual. For further information about 5.6.0, take a look at the list of more than 81 issues closed in Bugzilla. digiKam 5.6.0 Software collection source code tarball, Linux 32/64 bits AppImage bundles, MacOS package, and Windows 32/64 bits installers can be downloaded from this repository. Happy digiKaming while this summer!